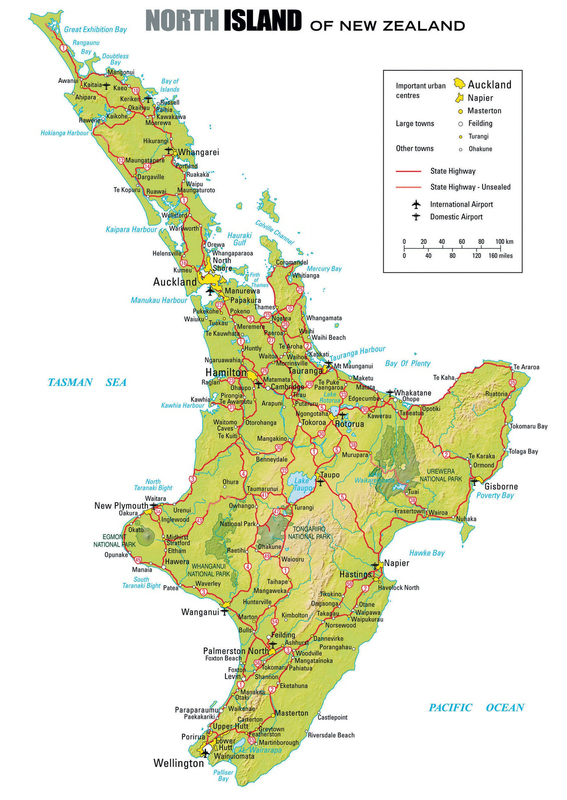 New Zealand is located in the southwestern Pacific Ocean 1,500km east of Australia and 1,000km from the Pacific Islands. It was called Aotearoa, ‘the land of the long white cloud’ by Maori, some of the early arrivals from the Pacific. 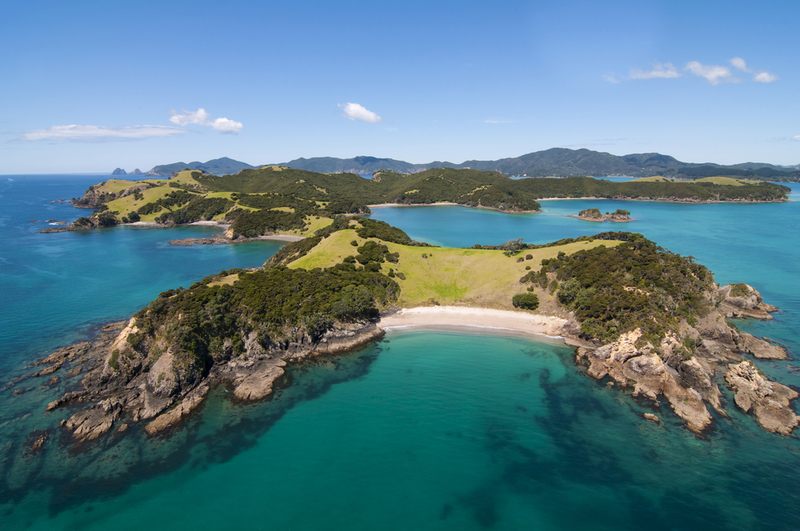 Made up of two main islands, the North Island, the South Island and several smaller Islands, its island location and spectacular terrain affects its climate, history and contemporary character. Because of its remoteness and being water locked it was one of the last countries in the world to be found and settled. New Zealand’s island setting presents breath taking landscapes brimming with the wonder of pristine scenery and magnificent waterways. 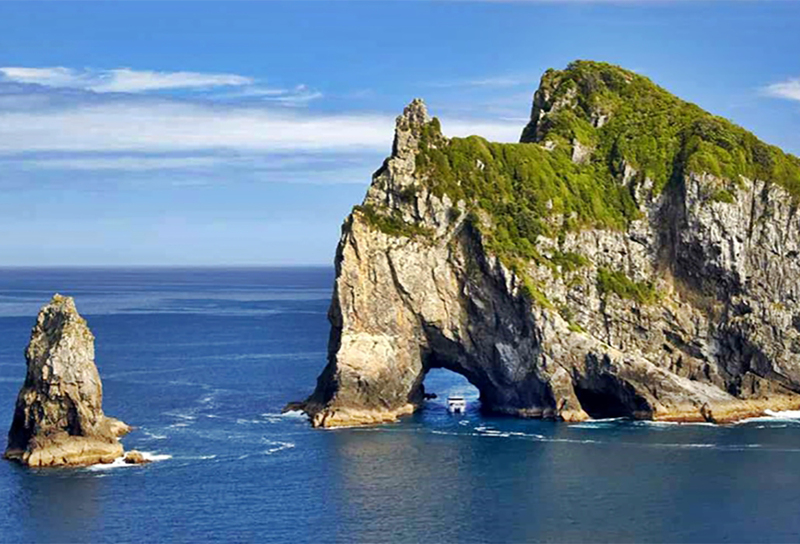 Grand Pacific Tours organised the Ultimate Small Group Tour in a superior coach like no other in New Zealand. The highest standard of features coupled with its environmental considerations made travelling a comfortable and memorable experience. A little light hearted rivalry and teasing banter created the perfect ambiance and dynamics on this extensive journey. We travelled 3,224 kilometres across the country immersed in the history and culture, delighting in the vegetation and appreciating the natural environment. David Underwood coach driver and guide extraordinaire supported 20 participants with warmth, professionalism and an instinctive sense of anticipation. It was unexpected to note half the group were English and half Australian. 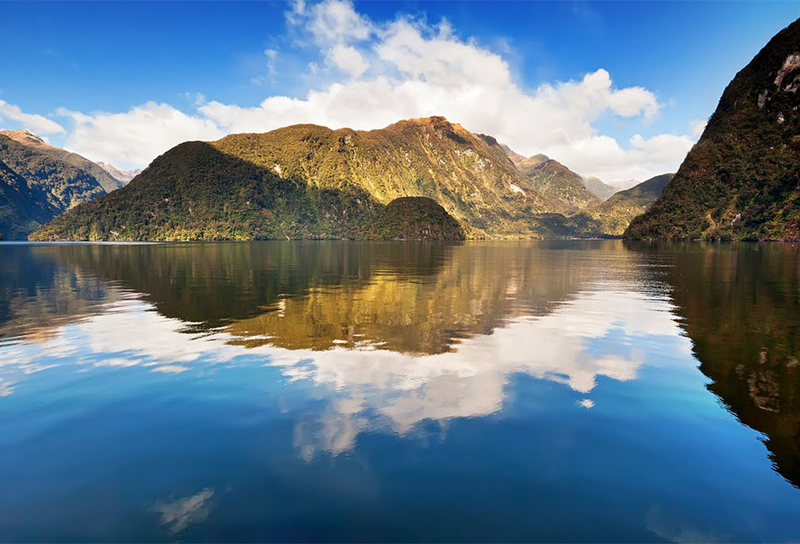 New Zealand is a tourist haven, diverse and dramatic. The harbour side city of Auckland dubbed the ‘City of Sails’ was our arrival destination and the gateway to the tour. 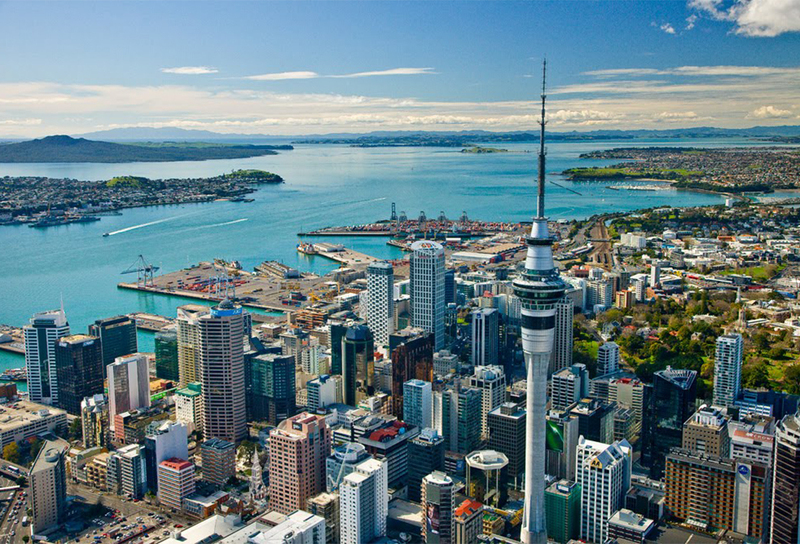 Auckland replaced Russell in the north as the capital of New Zealand in 1840 after the signing of the Treaty of Waitangi. However, Wellington to the south more centrally located was to become the capital in 1864. 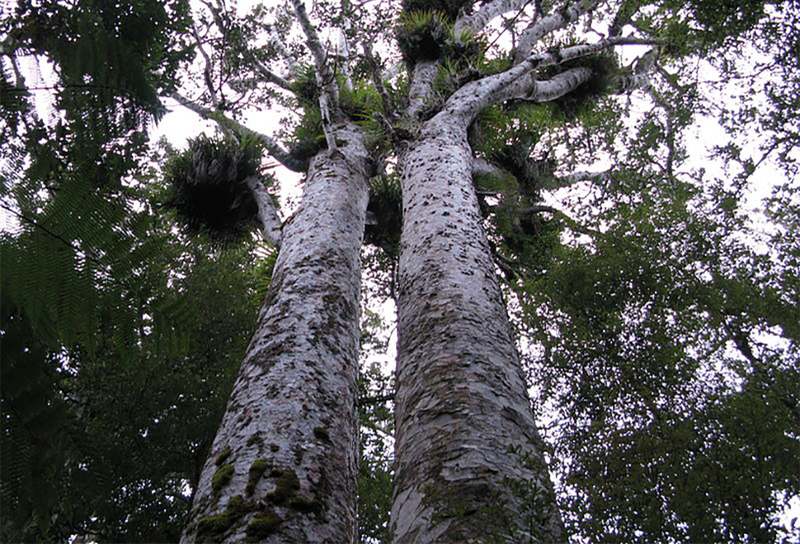 Beyond Auckland we journeyed 45 minutes to the Giant Kauri Trees in Waipoua Forest to observe one of the largest surviving trees, the McKinney Kauri over 800 years old. It grows majestically amid a constructed viewing platform. An eerie stillness descended on me as I filtered the history and changes observed by this imposing tree. Our next stop was the Kauri Museum at Matakohe where the mighty Kauri Tree, its timber and its gum are celebrated and the early settlers of New Zealand are honoured. 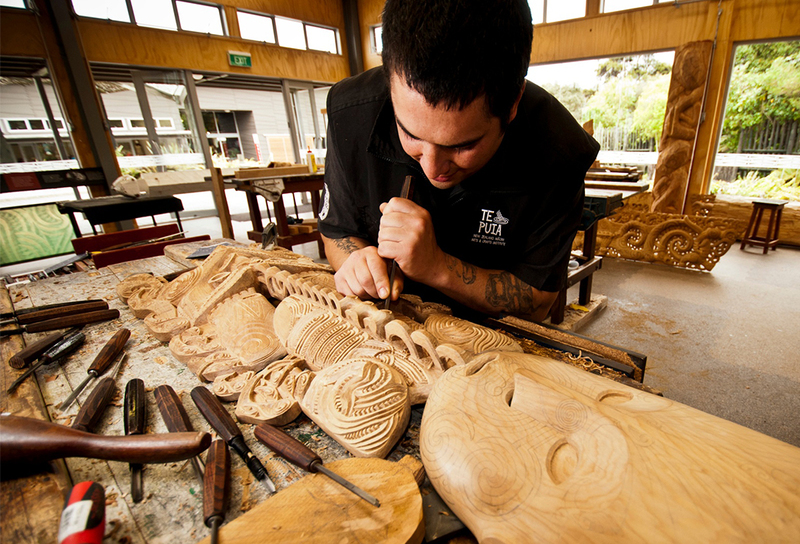 The Museum houses the largest selection of Kauri products in New Zealand. 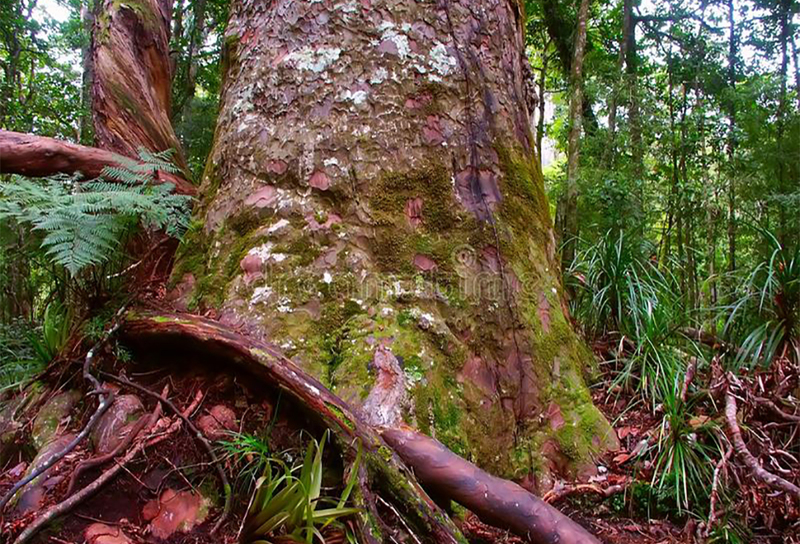 It was fascinating discovering how the pioneers harvested timber and gum from the giant trees. A genuine working mill demonstrates how logs were sawn into timber. There are examples of the original equipment used for felling trees, transporting logs, milling timber, collecting gum, and a Blacksmith’s workshop. Downstairs in the Museum is the world’s most impressive Kauri display of New Zealand amber (copal) including carved and specimen pieces recently formed. 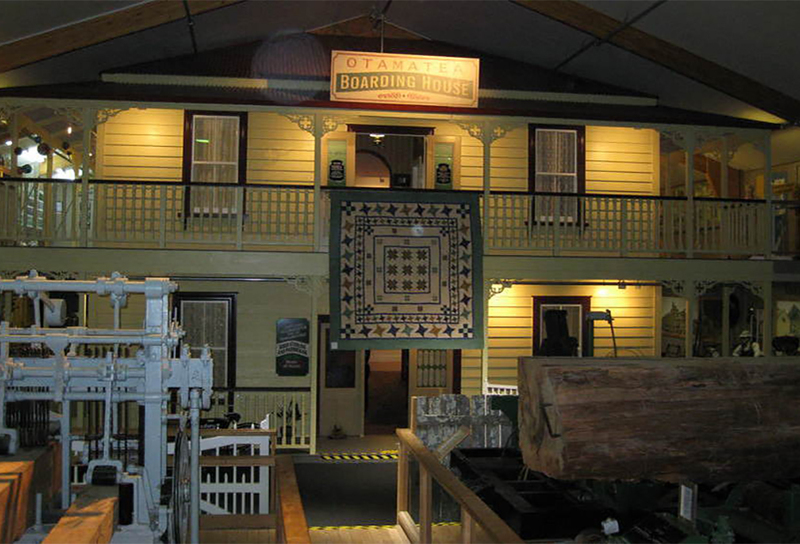 Equally impressive is the two storied (circa1910) life sized replica of the Otamatea Boarding House. 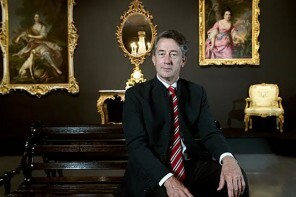 It captured the essence of the time through the acquisition of fine furnishings and attention to period detail. History and art in the making were sympathetically forged and displayed for an enthusiastic public. 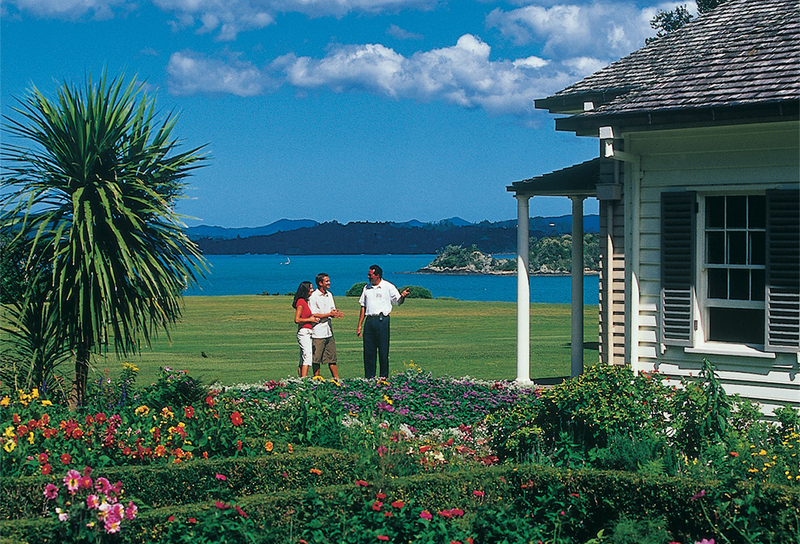 Next we journeyed to the Waitangi Treaty House, the most important historic site in New Zealand, situated overlooking the beautiful Bay of Islands. A guided tour of the expansive Waitangi Treaty Grounds, the location of the signing of the treaty between the Maori tribes and the British was informative. 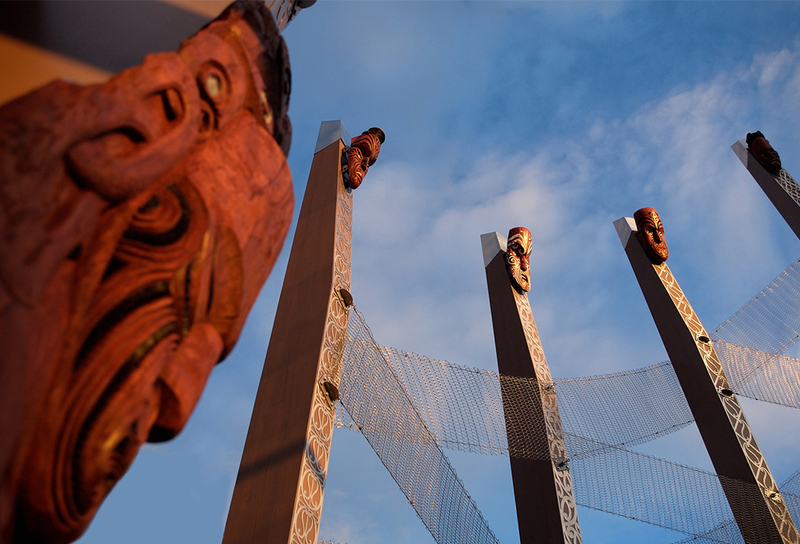 Today it is a gathering point for Maoris and government leaders on Waitangi Day. The Grounds are surrounded by an exquisite coastline, tidal estuary, mangrove swamp, forest and native bush. The dazzling setting with small islands and boats dotting the still waters was breath taking. 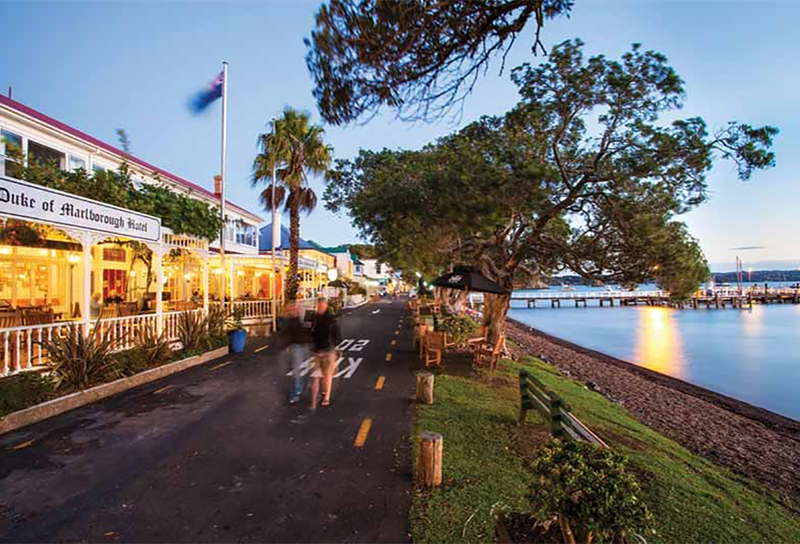 The Duke of Marlborough Hotel acquired New Zealand’s first liquor licence and is located on the waterfront. Sitting on the balcony, sipping a glass of crisp white wine and eating a delicious seafood lunch was very gratifying as I could cast my eyes across the sun-kissed tranquil Bay. Subsequently excitement bubbled as we boarded a luxury catamaran, destination, Cape Brett and the famous Hole in the Rock. This was an enchanting highlight as we were fortunate to spy both the bottlenose and common dolphin species swimming leaping and cavorting amid the sparkling aquamarine waters. Making our way through the Hole was exhilarating and surprising as the Captain commented it can only be safely attempted when the right conditions prevail. 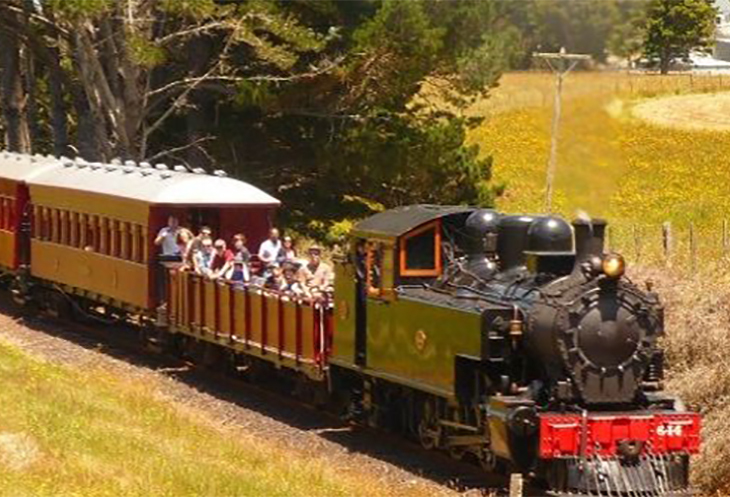 Next day the lovingly restored vintage steam train at Glenbrook Vintage Railway transported us back in time as we travelled on the 15 kilometre rail journey through the rural Franklin countryside. The interior wood panelling and long rows of single setting coupled with the immaculate condition of the train’s exterior was a fine example of the commitment and enthusiasm of the volunteer staff and maintenance workers. 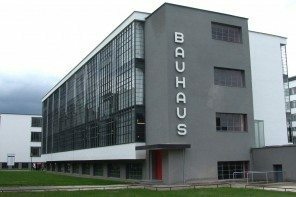 This nostalgic experience was enriched while walking through the restoration workshop at the station. Then we travelled through countryside of rolling hills and green pastures, diary country towards Rainbow Springs Kiwi Wildlife Park including Kiwi Encounter, a ‘conservation-in-action’ attraction. The centre incubates and hand raises chicks taken as eggs from the wild, when appropriate returning them back to the wild. We were lucky to be in the right place at the right time and were invited to observe as the handlers checked a male kiwi bird 35 years old, weighing and observing the internal beak, the claws and the very small wings. 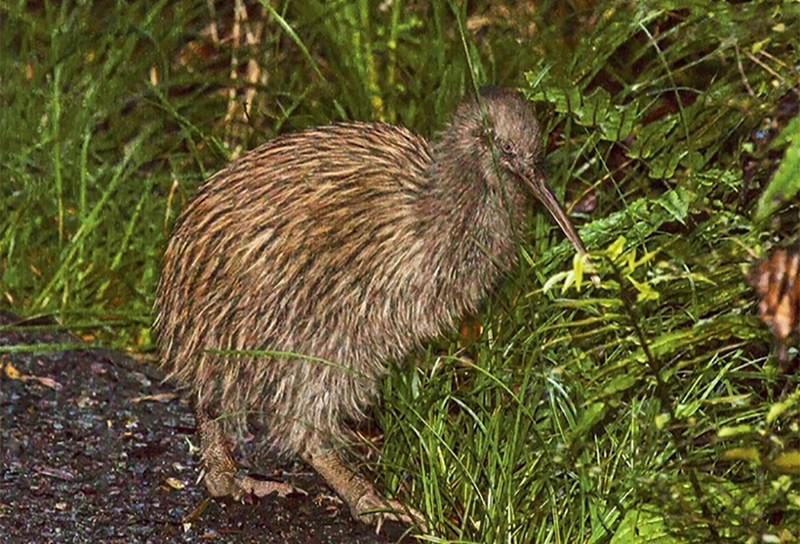 These flightless birds are a significant national icon, highly cherished by all cultures in New Zealand. Next morning began with a gondola ride up to Mount Ngongotaha at Skyline Rotorua Adventure Park. Thrilling expansive views of the city and Lake Rotorua (the second largest lake in the North Island) were admired as we savoured a champagne breakfast at the Stratosfare Restaurant. 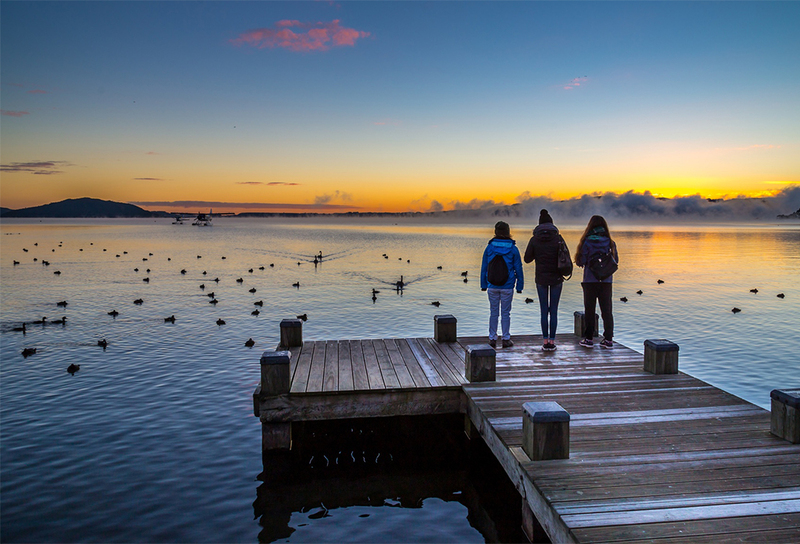 Lake Rotorua is an idyllic place to watch the sun come up. The birdlife, Mokoia Island and the geothermal activity ever-present on this lake’s shores make any walk on the lakefront a memorable one. At Te Puia there are fine samples of Maori architecture including the traditional example Rotowhio marae while Heketanga-a-Rangi is a more contemporary structure. Maori architecture imaginatively tells their stories and exhibits their unique artistry. While there we experienced a welcoming ceremony and the energetic dance and music of the Maori Cultural Performance inside a carved Maori meeting house and later enjoyed authentic Maori food. 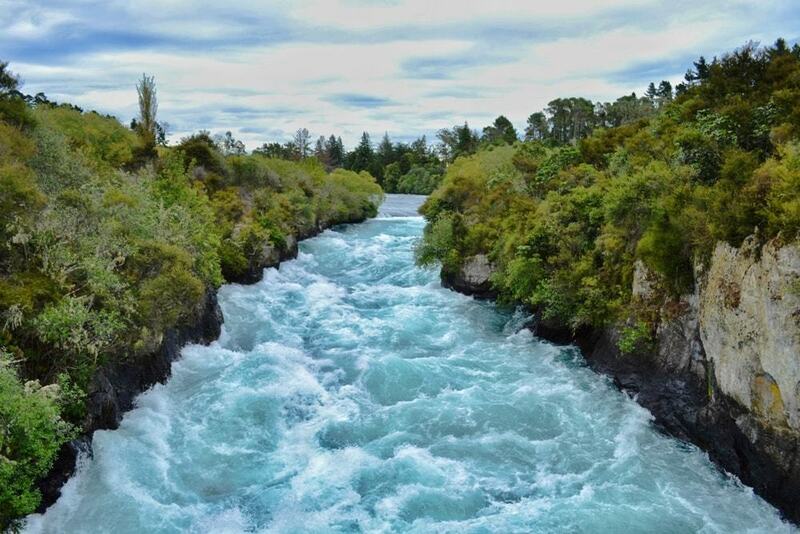 The next day we travelled along the Thermal Explorer Highway to the spectacular Huka Falls. The thrashing, thundering turbulent and fast moving waters cascaded with a violent force that erupted in a rising mist of white spray. We continued wandering to the lakeside town of Taupo positioned against the glorious Lake Taupo. The Lake is about the size of Singapore. Its enormous size and crystal blue water (the largest freshwater lake in the southern hemisphere) is staggering. Lake Taupo sits in the caldera of a volcano that began erupting 300,000 years ago. 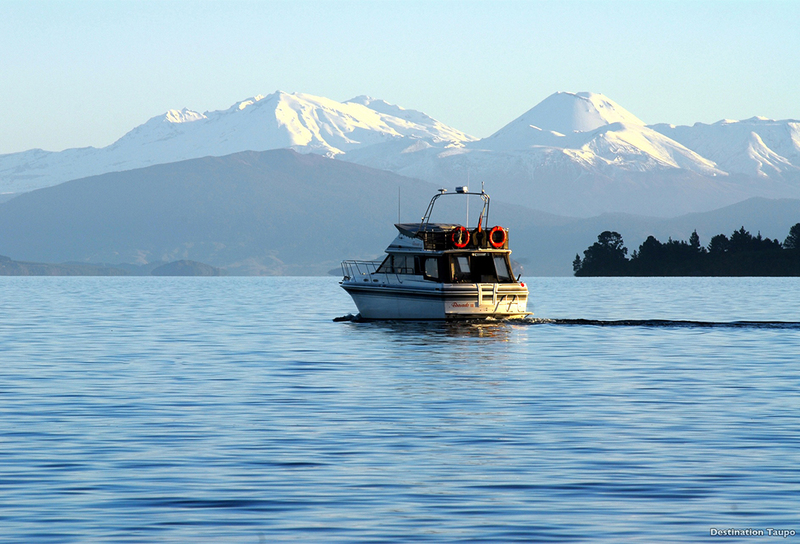 In any season, cruising on Lake Taupo will allow you to appreciate the awesome grandeur of the North Islands volcanic region. To the south you’ll see the giant volcanoes of Tongariro National Park. Beneath you is the Taupo caldera – one of the world’s few super volcanoes, which last erupted around 1800 years ago. Next stop Wellington the country’s creative and culinary capital, situated between two of New Zealand’s finest wine regions, Wairarapa and Martinborough. The area is ideal for grapevines because of its soils and climate. Wairarapa is renowned for its world-class Pinot Noir and charming rural setting. 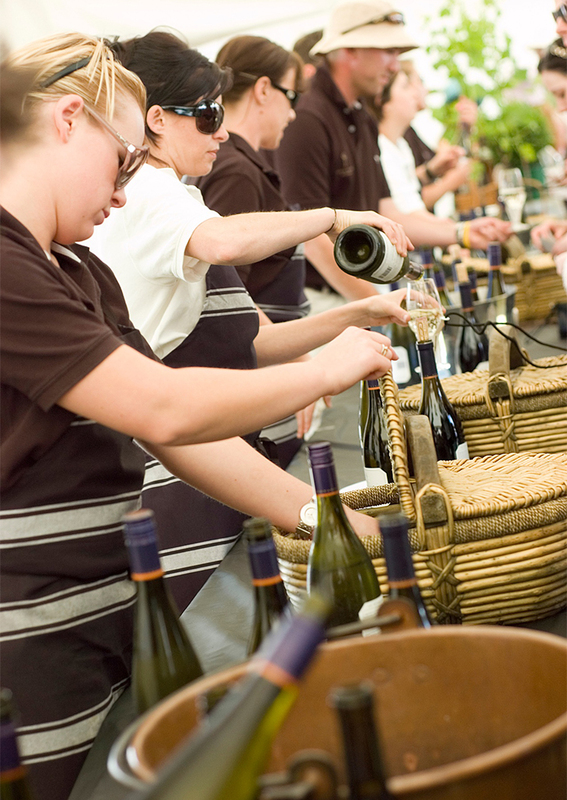 The promise of new wine releases draws the crowds each year to the Toast Martinborough wine, food and music festival. More than 30 vineyards surround the town square, each matching fresh food from local and Wellington restaurants to their carefully crafted wines. Live music and a free bus between the vineyards ensure a festive time for all. Wellington showcases New Zealand’s history and culture and was our final destination before boarding the Interislander Ferry, crossing the Cook Strait and observing the scenery of Marlborough Sounds. Finally we docked at Picton on the South Island, ready for stage two of our journey. The beauty of the North Island’s patchwork of landscapes, waterways, history and culture was engaging and inspiring.